A tricky insect-eating plant from Borneo is living proof that one need not have a brain to outsmart the opposition. 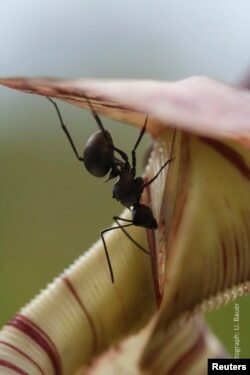 Scientists say the tropical carnivorous plant regularly exploits natural weather fluctuations to adjust the slipperiness of its pitfall traps in order to capture and dine on batches of ants at one time rather than individual ants. The trap of an insect-eating Nepenthes pitcher plant, swarming with nectar-collecting ants, is seen in this undated handout picture courtesy of Dr. Ulrike Bauer, University of Bristol, U.K. 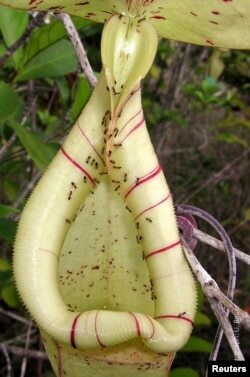 The research involved an Asian species of pitcher plant, so named because its leaves form cup-shaped insect traps that look like a pitcher. When the rim of the plant becomes wet, it gets extremely slippery and ants walking on the surface fall victim to the voracious vegetation. In hot, sunny weather, however, the surface dries and becomes safe for ants to visit. Individual ants serving as scouts for their colonies discover and collect sweet nectar from the trap and return to their nest to tell their fellow ants where to find a nice meal. Numerous ants then march unwittingly into the trap in search of food and are captured because the plant has made its trap slippery and inescapable. So by letting the individual scouts escape, the plant eventually manages to capture much more prey. To control when its trap is slippery, the pitcher plant secretes sugary nectar that primes the trapping surface to become wet through condensation at lower humidity levels than other plant surfaces. That activates the trap during afternoons, when many day-active insects are still out and about. A worker ant collects sweet nectar from the trap of an insect-eating Nepenthes pitcher plant in this undated handout picture courtesy of Dr. Ulrike Bauer, University of Bristol, U.K.
"Of course a plant is not clever in the human sense — it cannot plot. However, natural selection is very relentless and will only reward the most successful strategies," said biologist Ulrike Bauer of Britain's University of Bristol, who led the study being published Wednesday in the scientific journal Proceedings of the Royal Society B. There are about 600 species of carnivorous plants known worldwide. The pitcher plants generally grow in nutrient-poor habitats, which is why they capture animal prey to feed on. Most species trap insects. A few attract small mammals and collect their feces for nourishment. "What superficially looks like an arms race between nectar robbers and deadly predators could in fact be a sophisticated case of mutual benefit," Bauer said. "As long as the energy gain [eating the nectar] outweighs the loss of worker ants, the ant colony benefits from the relationship just as much as the plant does."